Why do I have to retune my DAB radio? It is often necessary to perform a scan on your radio to pick up new multiplexes (or bundles of stations) when they launch. Sometimes individual stations appear on, or disappear from, a multiplex and it's a good idea to periodically re-scan to make sure you're not missing any new services. In addition, some stations move to other frequencies (blocks, or bundles of stations) on digital radio, which means you may need to retune to see if they've popped up somewhere else. Which new stations might I receive if I retune my DAB radio? Local digital radio is moving channels in some areas, most recently in and around Manchester and Liverpool. Re-tuning allows you to continue to receive these ensembles/bundles/set of stations. In February-March 2016, eighteen stations took to the airwaves as second national commercial digital radio bundle launches. On the air now in several major cities are DAB mini multiplexes - trials of DAB radio stations covering smaller areas, but with a wide variety not normally available anywhere else. In addition, new stations as outlined in news articles on this site regularly begin broadcasting on local and national digital radio up and down the country. Keep up-to-date with new stations as they launch by periodically retuning your DAB radio. How do I retune my DAB radio? 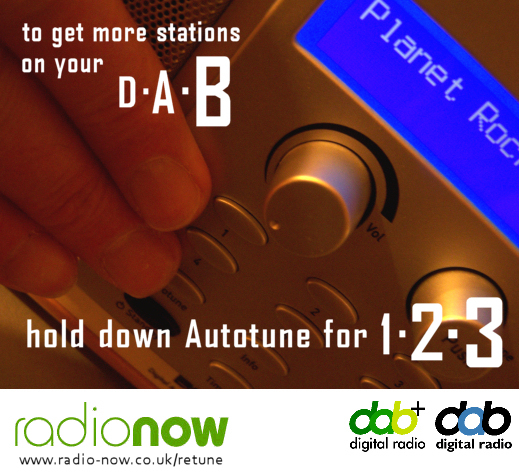 Press the Autotune, AutoScan or Scan button on your DAB digital radio. It usually takes no more than a minute for your radio to update the station list. Handy hint: try holding down the Autotune or Scan button for more than three seconds on some older DAB radios to make sure your radio performs a complete scan of the DAB waveband, to help it search for all new stations. What if my radio has no special button labelled Autotune, Scan or AutoScan? If there is no special button labelled Autotune, Scan or AutoScan, the option to retune is found by pressing the menu button, then turning the station selection dial left or right, or pressing forward or backwards on your DAB handheld's directional joystick, until you see the Autotune, AutoScan or Scan option, then pressing in the station select button, joystick or dial (as you would for choosing stations or for selecting options on your DAB radio). The radio will take a few moments to re-scan. If there is a choice of Local scan or Full scan (sometimes referred to as Rest of the world, choose a Full Scan or Rest of the world to pick up all stations broadcasting to your area (this is important in places like Devon, where a Full Scan is necessary to pick up new stations that are broadcast on channels further down or further up the band than was originally planned for). Sometimes, holding down the select button (or pressing in the dial) for more than three seconds will begin a full scan, when you are in the scan menu and are selecting the option to begin the scan. What if my radio has no menu button? On some models of DAB radio you may need to hold down the info button until the display changes to Station sort, then hold down the info button again until you see AutoScan. Then press the Enter or Select button to start the scan. Again, try holding down the button for more than 3 seconds when selecting the option to start the scan. If all else fails and you are still having problems finding your radio station, do a factory reset of your radio or turn off at the plug, leave overnight, then turn back on. A factory reset can usually be performed by holding down the info, select or menu button for at least 3 seconds on your radio, then holding down the select or tune button to confirm, if necessary. DAB radio models can be slightly different, so try each of the above buttons if available. How can I improve my chances of getting better DAB radio reception? Try moving your radio to an upstairs room near the window and fully extending the aerial in an upwards direction. Some radios have a tuning aid or can do a manual scan. If you're looking for the second, UK national commercial radio bundle, you'll need to tune to block/channel 11A. The tuning aid/reception strength meter will show a blank box with moving filled boxes on your DAB radio's display. The stronger the signal, the more filled boxes your radio will show in the tuning aid. The higher the percentage number displayed on the display, the more robust the signal you are receiving. These are boxes that typically plug into a mains socket to boost wi-fi internet access around your home. Some models can interfere with DAB and FM radio reception, so you could try temporarily turning these adapters off while you do a rescan on your DAB digital radio, or moving your DAB radio away from an adaptor as far as possible. If you still can't receive stations you were hoping to get, turn the adapters back on. What if I don't have a DAB+ radio to receive both DAB and DAB+ stations? No problem, check out our DAB Buyers' Guide and make sure the radio you choose has a 'digital tick' and/or the DAB and DAB+ logos on the box or in the description. Buying online? If a DAB receiver also receives DAB+ stations, this will be stated in the online description, or the digital radio 'tick' logo will be shown alongside or below the pictures of the receiver, on the product's webpage. How do I delete the stations with the "?" label? You can now delete stations in the list showing the "?" by selecting Trim stn. list under station order option in the menu settings. To find the station order option, turn the selection dial or use your DAB radio's directional joystick (depending on which model you have). Now that I've retuned, how do I store updated stations in memory? To save any stations that have moved to your DAB radio's preset memories, hold down the number key corresponding to the memory location that you want to store the radio station. Hold the number button down for at least five seconds. The station you are listening to will replace the station held in memory on that number key. If your DAB radio doesn't have number buttons to access presets directly, press the preset button, use the dial or directional joystick to select the correct memory location and press in the station selection dial or directional joystick. Be careful to choose the correct preset to overwrite this preset with the radio station you are currently listening to. What will happen to the labels showing as Moved? The stations showing as Moved in the list will eventually start showing as ?Moved and you won't hear any sound. At this point, if you haven't re-tuned you'll lose the ability to listen to the affected stations. If you want to remove the ?Moved label on your DAB radio, follow the instructions to Trim stn. list (trim the station list) above. What is DAB Digital Radio/Digital Audio Broadcasting? Digital Audio Broadcasting, or DAB, is the technology behind terrestrial digital radio. It brings a larger selection of different stations that broadcast in low, medium and high quality or in mono or stereo. Since there is limited space on DAB at the moment, some stations must broadcast in mono or at a lower quality "bitrate" in order that there is space for other stations. DAB+ (pronounced DABplus) is simply a more efficient way of broadcasting radio stations using less room than ordinary DAB. Ordinary DAB uses mp2 technology, whereas DAB+ uses a highly efficient MPEG-4 AAC v2 profile (HE-AAC v2), which gives better sound at much lower bitrates than is required of the mp2 codec for a similar quality of sound. Look out for the DAB+ logo and digital radio 'tick' marque on the box and on product information online. Our DAB digital radio Buyer's Guide suggests good quality receivers capable of tuning in to stations broadcasting in DAB and DAB+ formats. There's no hiss or crackle to spoil the sound you're listening to, though there may be the presence of digital "artifacts" in the sound you hear, depending on the broadcast quality of the station on your DAB digital radio. Newer DAB radios with the latest chipsets inside fade out the volume if the reception of a radio station reduces below a given threshold, rather than just the audio breaking up. There's no need to remember frequencies, either. You just look for the name of the station you want on the display of a DAB digital tuner and select it. Our radio station directory lists local and national DAB services. Remember when record shops started selling CDs? Listeners who were used to hearing their music on vinyl or cassette were suddenly given a third option. In the early days of CDs, the player itself was the expensive part of the deal, at least to start off with. The same is true of DAB digital radio. Flagship DAB digital tuners still leave quite a dent in your wallet, but many are equipped with Bluetooth and network audio features. Prices for simple DAB radios have tumbled in the last few years. Once you've bought a DAB radio, listening is completely free - there are no subscriptions to pay. DAB digital radio has other features that often aren't available with ordinary FM radios. You can display the name of the artist and track currently playing, or the current programme (if the station is set up to broadcast these things - most are now) and you can see what show or song is coming up next. National radio stations broadcast on the same frequency up and down the country, so unlike FM there's no need to keep re-tuning as a DAB digital radio in your car will automatically select the nearest transmitter for uninterrupted listening. If there's no DAB transmitter nearby, a DAB radio in your car may be able to tune back to FM. However, you will need to retune your DAB digital radio if you're moving around the country listening to local DAB digital radio stations. If you enter an adjoining area whose local multiplex carries the same station, you can keep on listening to that station by re-tuning. Many people think that if they have an ordinary FM radio labelled 'digital tuning' they can also receive DAB digital radio. The bad news is, they can't. Some people think that if they have a digital display on their FM radio they can also pick up DAB digital radio broadcasts as well. Unfortunately, this is not possible either. To hear DAB digital radio, you need a proper DAB radio, capable of picking up digital broadcasts. Sometimes you'll read that DAB digital radio gives 'CD-quality sound'. DAB can sound very good, and in a few cases better than FM as there's no discernable hiss, but it's not as high-quality as CD. Some stations broadcast in mono, just like their AM equivalents, though DAB sounds much better than AM. A handful of stations broadcast at a comparative quality to FM - stations such as BBC Radio 3 use a high "bitrate" to sound good on DAB digital radio. Other stations use lower bitrates, so their sound may suffer from artifacting and a noticeable "wobble" in the stereo sound. This has been likened to the sound of "chattering monkeys" in the sound. The lack of hiss on DAB, though, is a benefit. Whilst it's tricky to listen to mediumwave stations at night due to lots of interference, a robust DAB radio signal doesn't suffer from such interference and you can't hear this interference in the audio. It has a lot to do with where you live, but one of the best things about DAB digital radio is a greater choice of national stations and a wider selection of music types/genres. DAB digital radio is different because, instead of being made up of analogue waves, the radio signal is transmitted digitally, as a series of 'zeros and ones'. You don't need a satellite dish to receive digital radio, just an aerial positioned in the correct place. Most new DAB radios just come with a telescopic aerial, which is an efficient and cost effective way for manufacturer's to ensure you can recieve the most number of stations available in your area. Clock DAB radios ususally come with a wire, which can be hung on the wall to improve reception. 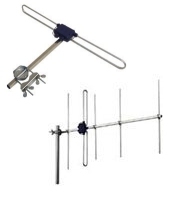 An aerial longer than 1.2metres will offer little improvement in reception, due to the way DAB signals are transmitted. Traditional FM analogue radio waves are sensitive to noise or distortion from electrical equipment or the atmosphere. The waves can bounce off tall buildings and hills and become interrupted or distorted. As DAB digital radio uses digital signals, with plenty of extra information transmitted to 'protect' the signal and allow the tuner to fill in any missing bits, the DAB signal does not suffer from the same problems as an FM signal. If you live in a weak or marginal signal area, you'll find that, even with all that extra information, the sound sometimes breaks up. Coverage maps you'll see on operator's websites usually underestimate how far a DAB signal will reach. If you live in a strong signal area, you'll find you have uninterrupted listening without 'drop-outs'. With recent improvements in coverage and transmitter build-out, it's not usually necessary to go to the expense of installing a loft aerial, but to experiment by placing your DAB radio near a window with the aerial fully extended, to maximise the number of stations you can receive. On the FM waveband, many stations use several frequencies to allow the station to be heard over a large area. The radio spectrum isn't used very efficiently, and often you must re-tune to a different frequency to follow the same station. The radio signals in Digital Audio Broadcasting are transmitted using a single frequency network (SFN), where all transmitters use the same frequency for a particular station. So, it is possible to listen to Classic FM or BBC Radio 3 without interruption across a percentage area of the UK. The operator of the group of services or stations will bring all these individual feeds together to form an ensemble. The ensemble is carried to all of the appropriate transmitter sites where the services can be transmitted. There is a practical limit to the number of digital programmes or services can be transmitted in one block (known as a multiplex), depending on the bitrate and audio codec used and error protection required (robustness of signal over a given area). This may allow up to twenty or more stations or services to be transmitted on a single frequency. This means that more services can be broadcast at the same time. The multiplex can carry a mixture of stereo and mono broadcasts, and data services. Data services might comprise of weather or travel information, or an EPG (electronic programme guide), which can be decoded by older sets or those with DAB slideshow capabilities (e.g. a colour display showing station artwork). Presently, BBC national digital radio covers more than 90 per cent of the population. Over the next couple of years more transmitters are to be added. The first and original National commercial digital radio multiplex covers more than 90 per cent of the UK's adult population. You can check for coverage in your area by checking your postcode here. The second National commercial digital radio multiplex presently covers about 73 percent of the UK's adult population and no plans have been published to increase the coverage area at time of writing (Spring 2016). You can find out about stations in your area by checking your postcode here. You can also listen over the internet to many DAB digital radio stations, to get a taste of what's available, or purchase a dedicated internet radio. Of course, the quality won't be identical to DAB digital radio (depending on the station it may be of better or worse quality), but at least you'll be able to sample any new stations available, which may help you to decide whether to buy a DAB digital radio or go for the internet radio option. It's worth pointing out that station availability varies across the country - different local stations are available in different areas. The other way to receive digital radio is via Sky satellite, free-to-view Freeview digital TV or Virgin Media cable television, however, the number of stations you can receive is limited and may not reflect what you would be able to hear on DAB digital radio in your area of the UK. Our listings giving channel numbers (or, more accurately, 'block numbers') for DAB digital radio (e.g. 11C, 12A, etc.) are not related to the Sky multiplex channel numbering system. A number of DAB digital radio stations have signed deals with Sky so that their station can also be heard via satellite television. These stations include national talk radio station talkSPORT and BBC Radio 6 Music; many more are available. Why do I need to buy a new radio? Digital radio uses a completely different technology to normal FM/AM radio. For starters, the radio signal is transmitted digitally to the digital radio, which then decodes the information, turning it into sound that you can hear. DAB digital radio uses mp2 digital compression; DAB+ uses a highly efficient MPEG-4 AAC v2 profile (HE-AAC v2). Neither of these types of radio signal can be decoded by a normal analogue (AM/FM) radio. Additionally, digital radio uses different frequencies than normal FM/AM radio (actually, those that were once used to broadcast black-and-white television!). Hence you need a digital radio to receive digital broadcasts. Does it cost anything to listen, after buying a new radio? No, not to radio stations. DAB Digital Radio technology allows listeners to receive any kind of data - even programme listings. How many stations should I be able to receive? DAB digital radio stations are transmitted in "multiplexes" - basically a large number of stations grouped together. It depends on where you live as to whether you can receive digital radio, and how many multiplexes you can pick up. If you can pick up a particular multiplex, you will be able to hear all of those stations that broadcast on the multiplex. You can do a postcode search at the top of this page. You may also be able to receive more than 6 local and national digital multiplexes. Again, it depends on where you live as to how many local multiplexes you could pick up. For example, in London there are three 'local' multiplexes in addition to the three national multiplexes. It is also possible to pick up adjacent multiplexes, e.g. ones serving Kent, Surrey and Sussex. Will the launch of a new multiplex mean that I won't be able to listen to stations on another multiplex any more? When a new multiplex launches, it very rarely affects the services you can receive on other existing multiplexes. It is launched alongside any multiplex already broadcasting, using a different frequency. A new multiplex will give you a number of additional stations - broadening your choice. Occasionally, a station will transfer from one multiplex to another - that's why it's a good idea to retune your DAB radio if you see a station disappear from your station list. A multiplex or ensemble can be thought of as simply a number of stations that are grouped together, to make it efficient for them to be transmitted digitally. However, there is a practical limit to the size of this group - and this is important as it means one DAB digital radio multiplex cannot carry more than about twenty radio stations in total (although there is capacity for data services and such like, which take up much less room on a multiplex). There are other local digital multiplexes (stations that are grouped together) that serve a particular area, for example: a multiplex that serves Tyne and Wear, one that serves Leeds, and so on. These multiplexes contain different local radio stations depending on the area they serve. For example, Metro Radio is one station that is part of the local digital multiplex for Tyne and Wear, as it is a local radio station serving Newcastle. However Metro Radio is not available on the multiplex that serves Leeds, for the simple reason that the station is local and relevant to Newcastle, not Leeds. There are two national commercial digital radio multiplexes and one that carries all of the BBC national radio stations, such as BBC Radio 1, 2, 3, 4 and Five Live. The two commercial multiplexes carry national commercial stations such as Classic FM, Absolute Radio, Virgin Radio, talkRADIO and talkSPORT. There are, however, stations such as Capital and Gold that can be heard in several different parts of the country on local digital radio. These stations have signed up with local operators to ensure they are heard on many local digital multiplexes, gaining almost national coverage in some cases. To summarise, it really depends on where you live as to which stations you can hear, and that is why our listings are divided up on both local, regional and national levels. DAB digital radio isn't too different to normal analogue radio in this respect; the number of services is still finite. How much of the UK is covered by DAB digital radio? All of the above stations are up and running, but a lot depends on where you live. Digital radio will eventually cover most of the United Kingdom, but at the moment there are many areas of the UK where you will not be able to receive digital radio. Presently, BBC national DAB digital radio and D1 national commercial DAB digital radio covers more than 90 per cent of the population. Even in areas where digital radio transmitters have been installed, the signal is often not strong enough to allow you to tune in to a multiplex. You may find that you need to install an external aerial, even if you've been able to pick up ordinary FM broadcasts perfectly well. This is because the transmitter sites are often situated further away than FM transmitters. Transmitters are being built for the BBC's national services all over the country and you can check our radio news pages for timely information about transmitter switch-ons. Which other stations can I listen to? As well as the large national digital stations, you can also tune in to your existing BBC local radio station on digital radio. You might also find your local independent station as well. However, not all existing local radio stations have secured a place on digital radio yet, often due to the carriage costs involved. Can I listen to UK DAB digital radio stations if I live in Spain, Germany, etc.? No, the DAB signals do not travel that far. You would not be able to pick up any UK services using a DAB digital tuner abroad. To see which country-specific services may be up and running in other countries, please see the World DAB site. Why can't I hear every UK station on digital radio, no matter where I might be in the country? For the simple reason there isn't enough room or capacity on DAB digital radio to carry every radio station. The way that digital radio signals are transmitted (as a multiplex group, or ensemble, made up of different stations) makes much more efficient use of the broadcast spectrum, but is is still not physically possible for every national, regional and local radio station to be heard everywhere in the UK.